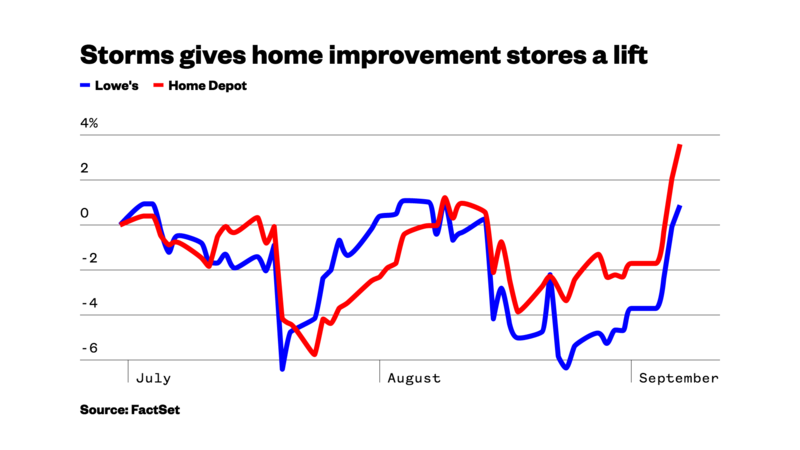 The sight of shoppers surging into home improvement stores to prepare for—and clean up after—recent massive storms has lifted the share prices of Home Depot and Lowe’s in recent days. It’s no wonder. Plywood, flashlights, batteries, tarps, and propane are flying off the shelves throughout south Florida, as the state braces for Hurricane Irma to make landfall sometime over the next few days. And in and around Houston, the country’s fourth-largest metropolitan area, truckloads of drywall and other supplies are arriving by the day to be used in a rebuilding process that will take months, if not years. But for the record, Home Depot has been doing well for a while, with its share price outperforming the broader S&P 500 index even before the big storms showed up on the radar. With near record low inventory of homes available for sale, and few new homes being built, homeowners are increasingly turning to remodeling, which has been keeping profits solid for the country’s largest home retailer. China is the world’s largest exporter of plywood, with 17 percent of all global exports. That’s almost double the share of the next closest exporter, Canada, at nine percent global market share. The U.S. is the largest importer, consuming 15 percent of global plywood exports. U.S. spending on remodeling—both by homeowners and investment in rental properties—hit $360 billion in 2015. The lions share of homeowner remodeling–45 percent—is done in by homeowners in the 25 most expensive housing markets.